BELLEVUE, Wash., Jan. 25, 2018 -- OSNEXUS, the leading developer of grid-scale software-defined storage solutions, today announced the addition of Advanced Storage Analytics features to its QuantaStor Software-Defined Storage Platform enabling IT professionals to better visualize their storage assets for effective decisioning. 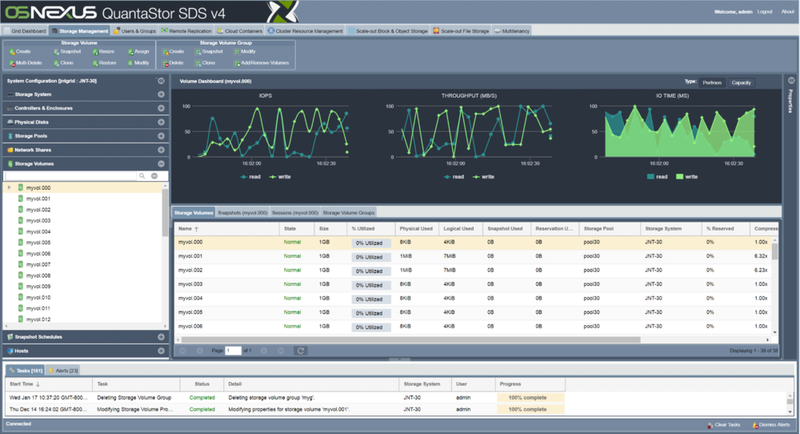 With Advanced Storage Analytics, QuantaStor SDS v4.5 will let users visualize file, block, and object storage utilization in graphs, charts, and real-time dashboards to better understand their storage needs and simplify capacity planning. The QuantaStor web-based grid management interface also includes real-time visual presentation of block storage performance, network utilization, CPU and memory utilization, object storage utilization, and network health diagnostics. "With these new storage-grid level dashboards and analytics tools in QuantaStor SDS v4.5, IT professionals will be able to take another leap forward in boosting the IT agility of their organizations," said Steven Umbehocker, CEO of OSNEXUS. "Being able to visualize how your storage assets are deployed combined with the ability to gather utilization metrics is really key for large organizations that require multi-tenancy features for chargeback accounting to different departments." QuantaStor SDS provides a REST API for advanced storage analytics while leveraging open technologies such as Telegraf and InfluxDB so that users can enhance and extend the data collection features within a QuantaStor storage grid. The OSNEXUS QuantaStor SDS platform delivers a complete array of enterprise features in a unified file, block, and object storage architecture. QuantaStor's unique storage grid technology links appliances together across sites so that data analytics can be viewed across all storage assets for an entire organization. With storage grids, companies can address a broad set of storage use cases including server virtualization, big data, cloud computing, archive, and high-performance applications all within a single grid. QuantaStor SDS v4.5 will be generally available at the end of Q1 2018.